Many people suffer discomfort after working long hours on the computer. This is in part due to the fact that computers produce an Electro-Magnetic Field (EMF radiation) which is considered to be harmful to the human body's own electrical field. 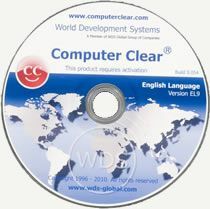 Computer Clear® is a software programme designed to counter the negative electro-magnetic effects on the body's bio-field, caused by the computer, its monitor, printer and other peripheral devices directly connected to the computer, and is also designed to combat the subtle negative radiation that comes through the Internet. Computer Clear® is now supplied with a license that allows installation on up to three computers. This could be one on your PC at home, one on your laptop, and one at your place of work; this is great news for the whole family as everybody can benefit. Computer Clear was field tested and given a favourable report in the August 8th 2001 Moneypenny Test, a regular column in The Times. The following is an extract from the article. "Well, my first reaction was pure cynicism, despite the fact that it has been endorsed by writers and researchers of repute. However, after using the program for almost a month now, I havedefinitely noticed a big difference. Instead of feeling stiff and groggy after 20 minutes at my machine,I can now sit for several hours with very short breaks."